The Russian nihilism of second half of the nineteenth century received all-European popularity. In many respects this occurred with the connection of creativity of the Russian writers. The significant place in promoting of ideas of the nihilism belongs to Fyodor Dostoevsky. The Russian nihilists considered that God doesn't exist, therefore any moral is relative, and the sense of life is concluded in destruction. Thus the political nihilists have thought. The philosophizing nihilists were convinced that life has no any sense, and some of them even denied the reality of the life at all. The philosophical nihilism had very ancient history. But the Russian nihilism usually associates with a secondary, political version of nihilism. Now we begin our story about it. It is well known that the first Soviet leader Vladimir Lenin hated Dostoevsky's creativity. "I have no free time for this rubbish ", "This is a kind of moralizing vomiting", "Re-read his book and threw aside", - thus the revolutionary leader characterized Dostoevsky's works. On the other hand, Lev Tolstoy was called by Lenin as "a block" and "experienced man", and even as "a mirror of the Russian revolution". What were the reasons of such opposite estimates? Lev Tolstoy was imposed by Lenin with his withdrawal from Orthodoxy and his demonstrative opposition to autocracy. It is possible to declare that Tolstoy took approximately the same place in public life of Russia at the beginning of the 20th century which was appropriated by Solzhenitsyn on an outcome of existence of the USSR. Both Tolstoy and Solzhenitsyn have loosened ideologically the existed political systems, though Solzhenitsyn circumspectly was engaged in this destructive process being turned out abroad. On the contrary, Dostoevsky has convincingly showed that so-called "Russian revolution" was actually not the revolution of Russian people, but was the revolution of some "active minority", or revolution of demons. Therefore Dostoevsky was forbidden in the USSR up to the 50th years of 20 century, when he was returned to the school program with his very weak and harmless story "Poor Folk". Only at Khrushchev’s epoch, when revolutionary demons and their descendants, being worried by Stalin repressions went to their historical homeland — Dostoevsky returned with "Crime and Punishment". The word "nihilism" was used in Russian literature for the first time in 1829 by publicist Nadezhdin in his article "The congestion of Nihilists", to which nobody paid attention. And only when IvanTurgenev have wrote in his novel "Fathers and Sons" (1862) about nihilist Bazarov, who said that any boots were much more useful than Raphael's pictures, such nihilism made great impression on youth and the word began to be used widely. When Turgenev returned from Europe to St.-Petersburg, there were many fires in the city in which the public opinion accused Chernyshevsky and the youth deceived by him. Thus the various acquaintances spoke to Turgenev: "Look what your nihilists do: burn down Petersburg!" Turgenev in reply has pretended coquettishly that didn't understand about what there was a speech. And in Dostoevsky's novel "The Demons" the mad governor von Lembke has desperately shouted: "It is arson! It is nihilism! If something flares, it is nihilism!" Many people really thought so. It is possible to understand these people, because the hero of the Turgenev’s novel, Bazarov, proclaimed that the society together with all its state institutes had to be destroyed. After publication of the novel of Ivan Turgenev all the young people which have said constantly that they wanted to overthrow the tsar, which derided religion, cut frogs, and also supported female equality and free love, began to be called as “nihilists”. So nihilists (men) were represented in literature in the form of criminals and bandits, who were looked externally similar as tramps, and nihilists (women) as their accomplices, who are externally similar as men. For example, in 1870 Russian writer Nikolai Leskov published the novel “At Daggers Drawn”, as an angry attack aimed at the nihilist movement, which caused Dostoevsky's sharp disapproval. Ivan Turgenev, who has composed Bazarov, didn't share his ideas. But Bazarov started leading his own life independent from the will of the author. The same may be told about the philosophizing nihilists thought up by Dostoevsky. The author wanted to show insolvency of their ideas, but suddenly these ideas became very strong and deep. Dostoevsky sought to consider sore points of human life and a non-existence to the latest limits and even further. Therefore philosophizing nihilists were looked so convincingly in his novels. And his political nihilists are represented derisively and mockingly. In 1866 Dostoevsky wrote to Katkov: "All nihilists were socialists... There were a lot of swindlers and small wreckers among them". - Ivan Sergeyevich, would you like to buy a telescope in order to see better our life from abroad? Ivan Turgenev heard this and became very upset, as he always considered himself like the big expert on the Russian life. Being not satisfied with this, Dostoevsky has represented Turgenev in his novel "The Demons" with image of the vainglorious writer Karmazinov. In the 19th century the Russian revolutionary populists were nihilists. There were three directions in their movement: the propagandists led by Lavrov, the rebels, led by Bakunin who has proclaimed the nihilistic thesis that any kind of destruction represented a version of creation and, at last, the conspirators, led by Tkachev. Tkachev was one of the first populists who refused to idealize the simple people and began to say that revolution would be the result of actions of "revolutionary minority", "people of the future", whom the Russian academician Igor Shafarevich called as "the small folk" later. "Idealization of uncivilized crowd, - thus Tkachev spoke, - was one of the most dangerous and most widespread illusions..." But Dostoevsky has idealized the Russian people, with whom he connected the future of Russia. It is necessary to recognize unfortunately that Tkachev's views concerning the people were closer to truth, than the views of Dostoevsky and Lev Tolstoy. The last one have found rescue from his youthful pessimism, expressed in persuasive reflections about senselessness of life, in unification with the simple people by means of disguise in country clothes. Dostoevsky anticipated Lev Tolstoy’s tragic and comic flight from his estate and his death, when he have wrote about the hero of his novel "The Demons" Stephen Verkhovensky, who also left his house, saw a lot of simple people and immediately died. His son, the leader of gang of the district demons Peter Verkhovensky (according to Dostoevsky's plan), was urged to serve as a caricature on the well-known nihilist, the follower of Tkachev, Sergey Nechaev, who, in his "Catechism of the Revolutionary" admitted honestly that "any revolutionary is a washed-up person". As a result Peter Verkhovensky had to become the most banal and belittled double of philosophizing nihilist Stavrogin in "The Demons". And liberal Stephen Verkhovensky, weather wanted he this or not, brought up unscrupulous and cruel nihilist Peter, just as in 1917 the Provisional Government created conditions for coming to power of Bolsheviks. Actually it is possible to confirm that political nihilism in Dostoevsky's image has became more or less banal and belittled continuation of nihilism philosophical. Now it is possible to notice that not only Vladimir Lenin hated the creativity of Dostoevsky. In today's Russia the modern demon Anatoly Chubais hates it too. Their positions are quite clear. And Vladimir Nabokov, well-known Russian writer of the 20th century, spoke about Dostoevsky in such a manner:" Let's agree that Dostoevsky — first of all – was the author of detective novels, where each character who has appeared before us, remained the same up to the end, with the developed habits and hyphens". Thus Nabokov wrote in his "Lectures about the Russian literature". Nabokov has introduced this idea after listed diagnoses of the main characters of Dostoevsky. He summarized that the world of the writer was the world of sick people which is interesting only to those who was sick himself. Certainly, heroes of works of Dostoevsky, having been in the turned world, had to become (or even to ache) on the head for the aim to see all the surrounding in the correct foreshortening. Whether Nabokov, who destroyed stereotypes concerning the settled ideas of Dostoevsky's creativity, acted as the nihilist himself? What is the philosophical nihilism? If briefly, without pressing in particular its various versions, the philosophical nihilism approves a non-existence priority (anything, emptiness) above the life, up to the full annihilation (destruction) of life. It is possible to carry out some ethical conclusions from this fundamental thesis. In the received conclusions the philosophical nihilism is crossed with political one, just as Stavrogin and Kirillov were crossed with Peter Verkhovensky. Nevertheless, the political nihilists, at least on the field of their denial of the standard ethical values, acted not as the purpose, but only as means of achievement of other, mercenary and ordinary purposes. So they represented a kind of weak imitation of philosophical nihilism. Friedrich Nietzsche, who has tried to clear the roots of this nihilism, attentively read and summarized Dostoevsky's novel "The Demons". Nietzsche considered the must general aspects of nihilism, such as illusiveness of idea of the transcendent God ("God died"), and also insolvency of a religious picture of the world acting as development of the idea of progress. He distinguished compassion, contempt and destruction as the fundamental signs of nihilism, and mentioned the pessimism as a source of nihilism and its classical representatives, such as Tolstoy and Dostoevsky. According to Nietzsche, they both were obviously inclined to compassion. Nietzsche explained this fact having addressed to the theory about racial fatigue of the Russian civilization and culture. (Other interesting representative of the German culture - Joseph Goebbels – also called Dostoevsky among his favourite writers. Darkness of the German soul is a very mysterious subject!) According to Nietzsche the consecutive nihilism is defined by its degree of exemption from behavioural dominants, ideals and values, from all usual moral, just as from recognition of ideal measurement of human existence as a whole. Stavrogin's scandalous confession in which he told about how he raped the juvenile girl, who didn't take out such mockery and was hung up - may be an indicative example of such release. However, Nietzsche, with all his loud appeals to revaluation of values, wasn't ready to accept Stavrogin's radical nihilism. The philosopher showed some kind of intellectual cowardice, having said that the original nihilism assumes the sufferings, caused pleasure as an indirect acceptance of reality. "The nihilism represents the main direction of the development of Western history, - thus Martin Heidegger declared in the 20th century. - This movement finds out such depth that its expansion can have as a result only the world accident". "The absolute knowledge demands the most radical nihilism", - thus the representative of philosophy of a postmodern Jean-François Lyotard claimed. And the modern Russian philosopher Chanyshev proclaimed the absolute character of Non-Existence, which generated and inevitably destroyed any being. Everything arises for a while, and perishes forever: the person comes from a Non-Existence and falls into it, without having understood anything. Dostoevsky has showed a problem of nihilism in such a substantial scale, that only radical ways of the decision became acceptable. Whether Existence was eternal, or it was deceptive, and this meant that it wasn't present and wouldn't be at all. This is Dostoevsky's unfairly forgotten early story. The characters of the story lived on the verge of real and imagined, madness and health, which mutual transitions were so imperceptible that any distinction between life and a Non-Existence was erased. Dostoevsky has debuted before this novel with far-fetched and lifeless imitation of Gogol, the story "Poor Folk" ("new Gogol appears! "), which caused unlimited praises of Belinsky. He hoped that the new author would be able to replace Gogol, who was gradually falling into religious obscurantism. However, Dostoevsky, in his novel "The Hostess", unexpectedly went to the gloomy and mysterious area, having plunged into darkness of soul and opening gallery of mysterious outcasts with the image of Murin. The main hero of "The Hostess", Ordyntsev, and the hostess named Catherine herself, were absolutely ambiguous. So Belinsky has responded about the story "The Hostess" in the spirit of Lenin’s later statements: "nasty thing" and " terrible nonsense ". Many people thought that revolution in Dostoevsky's outlook was connected with his stay on penal servitude however the first sources of his latest philosophical reflections could be founded in his story "The Hostess". The main character of this novel - Rodion Raskolnikov - was in spiritual relationship with the first nihilists of the Russian literature. But Raskolnikov had a serious advantage - both before Bazarov, and before the hero of "Notes from an Underground", because unlike them he has not only talked and swore, but passed directly to practice. According to Dostoevsky's plan, verification of the theory by the direct action had to put Raskolnikov to awareness of insolvency of his own nihilism. Thus the author gave to the hero the chance of repentance with the help of deeply religious prostitute Sonia Marmeladova. By reading the Bible she persuaded Raskolnikov to repent and admit his murder. Vladimir Nabokov pointed fairly to obvious artificiality of the theatrical scene when "murderer and loose woman united during reading the eternal book". 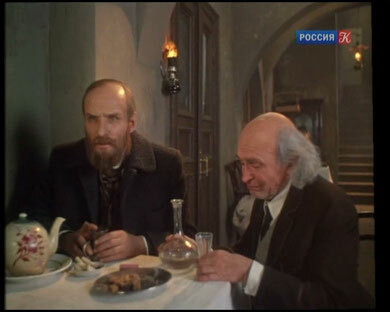 In the ending of the last Russian screen version of the "Crime and Punishment" impressively created by director Dmitry Svetozarov, Rodion Raskolnikov has been repented about his recognition and didn't refuse his idea. He has regretted that he remained a kind of a shivering creature, but not about the murder. This ending didn't correspond to the text of Dostoevsky’s novel, but quite coincides with logic of development of outlook of the main character. Another hero of the novel, Svidrigaylov, appeared much more consecutive nihilist then Raskolnikov. He showed that, being the nihilist, it was optional to kill people by an axe, but it would be more important to realize his own willfulness as fundamental value. This novel narrated why the idea of remaking the world by means of Good is a kind of madness. The world is initially evil, so everything represents various, sometimes rather deceptive and freakish forms of redistribution of the same Evil. Sometimes Evil pretends to be good for the aim to overcome its competitors. If somebody attempts to imagine the world which is building on the basis of the final celebration of Good, it would be real idiocy. Thus is the reason of the name of the novel and the name of the main character, actually, the idiot. Prince Myshkin has tried to create Good, and, for the aim of the purity of experiment, Dostoevsky gave him financial leverages in the form of unexpected receiving inheritance. As a result of altruistic feeble efforts of the idiot, the inevitable process of prompt increase of the cash evil has began, which reached its apogee with Nastasia Filippovna's flight from the kind prince to angry Rogozhin and her death. The main character of the novel "The Idiot" actually is Hippolyte – the young man, who realized himself as “being who denies everything”, and who "had to die inevitably", especially just as all the people were sentenced to death. So he decided to take execution of the sentence in his own hands. However, when Hippolyte has learned that he was fatally sick, he decided to postpone a suicide. He wanted to look as the self-satisfied and fateful world would painfully suffer, redistributing its Evil. Hippolyte's interest to the world was a curiosity of very metaphysical plan, so "Hippolyte's Confession" became the strongest text created by Dostoevsky, which, due to a misunderstanding, was put into the weak and far-fetched novel "The Idiot". The main character of the novel "The Demons" Stavrogin has denied the world and, according to the nihilistic principle of willfulness, rejected any obligations and relations with other people. Throughout the novel the fateful world with its stupid puppets danced and wriggled round the lonely thinker, but he kept absolute tranquility, which was similar to the well-known apathy of ancient philosophers. Sometimes Stavrogin showed some easy activity with a great deal of boredom, which reminded the fuss of Bazarov with frogs. In reply the provincial bog started croaking and letting out loudly the putrefactive gases, being pleased that it was noticed and, therefore, it existed. Thus the quantity of the cash Evil increased with the geometrical progression. Then Stavrogin came back to his usual loneliness and apathy, having satisfied his metaphysical curiosity. "There is only one rather serious philosophical problem - a suicide problem... to solve to live or not to live means to answer a fundamental question of philosophy", - thus Albert Camus wrote in connection with the novel "The Demons". So Dostoevsky, being the ingenious writer, gave the honest answer on this last condemned question. The engineer Kirillov has declared his wish to commit suicide, as "such was his idea". And Kirillov's idea was a kind of overestimated ideas, because for the aim of its realization he was quite ready to die. Kirillov knew that the God didn't exist, but the God had to be. If the God didn't exist, then Kirillov became the God himself. But the God didn't exist all the same, so Kirillov had to kill himself for the aim to become the absent God. And Kirillov (from positions of his potential divinity), indifferently looked at various demons, which were fussing round him: "I defined that night that everything was indifferent for me now". Kirillov has become convinced that Jesus was deceived, like all ordinary people, "laws of the nature also forced him to live among lie and to die for lie". Therefore the tragedy of each human life was embodied in Jesus. Each of us would be crucified and deceived like the Christ. The shot from the Kirillov's gun has sounded as a signal for the beginning of nihilistic revolution, which would be directed on destruction of lie and deception. As fairly Camus noticed, not despair, but love to the Mankind, has pushed Kirillov to death. Before finishing bloody and unprecedented act of spirit, Kirillov said words so ancient, as all human sufferings were: everything is ok! While Kirillov committed suicide for the aim to declare his own willfulness as a man who has became a God, Stavrogin realized the God as the Non-Existence and directed himself to his God. In 1876 – the philosophical suicide of Philippe Maynlender, who has understood that the cooling-down Universe was a body of died God. He didn't wish to live in a corpse of the God after that. In 1903 – occurred the philosophical suicide of Otto Weininger. This Jewish philosopher hated women and Jews. When he found many female properties in his own character, this led him to despair and death. In general, practically all teenagers are nihilists. And some of them will not mature at all. Thus the hero of "The Teenager", Versilov, spoke: "The real nihilist can't, shouldn't reconcile with anything from existing. He doesn't dare to go on transactions not under any circumstances". “It must be the devil,” said Ivan Karamazov, smiling. Thus, the main secret of Ivan Karamazov's philosophy and ethics consisted on his understanding and apologia of absolute absence. Where everything was dissolved in anything, the original philosophical nihilism has dominated. Thus, our world constantly develops its false reality, following the law of redistribution of the evil. Therefore, as the first Christian eremites, "desert fathers" were convinced very long time ago, the person subordinated to the world, is subordinated to the evil. "Laws of the nature can't be forgiven", - thus Dostoevsky's underground protagonist spoke. So the nature is such a lie which is necessary to destroy. The idea of rejection not only the socio-political device of Russia, but also the world as a whole, was characteristic for Dostoevsky's most intellectual - powerful, mysterious characters: such as an Underground Man, Svidrigaylov, Hippolyte, Stavrogin, Kirillov, Ivan Karamazov. And this wasn't casual, because any intellectualism, being brought up to its logical end, would came to an end with the nihilistic revolt. The heroes, which have denying the world, couldn't win against it yet, but, unlike absolutely artificial, schematic characters, like prince Myshkin and the participants of a circle of Peter Verchovensky, they wasn't won by the world. Thus was the existential and ontological sense of philosophical works of Dostoevsky.